I had to go back and read what I had written in that article and was relieved to see that although written in 2009 the article still accurately reflects a very basic truth about gardening. That truth is that you do not have to do battle with nature in order to grow and eat food. Furthermore, the truth is that in doing battle with nature to produce crops you put yourself on a treadmill that is expensive, toxic, time consuming, and will ultimately fail because it is unsustainable. Don’t get me wrong, I am not saying that there are no pests and disease in my garden, or that I do absolutely nothing to mitigate the impact of pests. I still use some of the practices I wrote about in my Garden Pests: Nematodes article, but I don’t do battle, and I don’t lose my mind, or jump into action when I see pests in the garden. I don’t get 100% of the crops I grow, but there is plenty for my family, some surplus for friends, a little for the garden pests (the worst of which are squirrels), and plenty for the soil. If I consider what Eden might have been, I imagine a place buzzing with life. Certainly that wouldn’t have exclude aphids any more than it excluded snakes. Coincidentally, on Saturday March 7th at 10 am Lucie and I will be presenting Pests and Disease In The Permaculture Garden at the Leisure Square Community Center at 3705 16th St. in Vero Beach. Attendees will learn about the strategies we use in our gardens and in our clients gardens for successful natural gardening without having to do battle with pests and disease. At 11:30 we will be visiting a local garden where the principles and practices we will go over in the classroom are being employed to produce lots of food naturally. 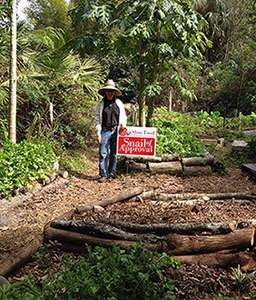 Pests and Disease In The Permaculture Garden is the 5th class in A Year In The Permaculture Garden series. It is I think one of the most impactful classes we offer. For a doubtful gardener it could be the pivotal point in simplifying and improving the garden culture practiced. Please see the poster below if you are interested in registering for this class. A very helpful and insightful response. Such conversation is much needed.